I get a lot of questions about storage and backup drives, so I thought I’d share my thoughts on external hard drives (EHDs) and Network Attached Storage (NAS) boxes. Photographers often run out of disk space because of all the RAW images they store, but this information goes for anyone who is looking for external storage devices for their computer. There are pros and cons to both options, so these are things to consider before you make a purchase. External hard drives are a simple and inexpensive way to add more storage or a backup drive to your computer. They require little to no setup, and come in sizes up to 8TB for under $200. This is a great option when you’re running out of space on your computer and want to move some files off your main hard drive. Or, adding an EHD is an easy way to backup your computer and/or another EHD. Read my tech tip on backing up your computer for details about how to configure backups to an EHD. Allows you to restore from prior backup if a file is corrupted or deleted. Despite these cons, I mostly recommend EHDs to the majority of computer users. As far as specific models go, I personally use, and highly recommend, the Seagate Backup Plus Hub. I have a 5TB model that I purchased from Costco, or here are some models available on Amazon.com. Network Attached Storage devices can seem like a great option if you have a lot of data to store or need centrally located storage. NAS boxes act as a data server on your home or office network that you access over a wired or wireless network connection. But they are not for the average computer user in my opinion. I do not recommend a NAS device unless you know someone technical who can set it up for you and help you if you have any trouble with it. I’ve worked in IT for 20 years, but my husband configured and maintains our NAS box, because he is more technical than I am. While the manufacturers are starting to market toward consumers and have done a lot to make their products user-friendly, I wouldn’t feel comfortable setting up a NAS box on my own. One final consideration with a NAS device is that the redundancy they provide is not the same as having a backup. With a backup drive, you can typically restore from a file that was backed up a week or a month prior. This means that if something happened to a file or folder in that time period, you could restore a previous version of the file or folder. With a NAS, you have two copies of your current data, but no historical backup data to restore from. There are two main types of NAS device setups. One is designed to provide a large single drive with data redundancy, and the other just provides data redundancy through a simple mirrored drive configuration. NAS boxes with 3 or more drives are typically configured to provide more storage than a standard EHD. This is known as a “RAID 5” setup. This means that data is shared over multiple drives (called an array), making it appear as one big drive. RAID 5 also offers some protection against failing drives, because part of each drive is used as a copy of data on the other drives. How this works exactly can be confusing, but all you need to know is that a single drive in your RAID 5 array can fail and you will not lose any data. You just replace the failed drive and the array will rebuild itself with all your data intact. However, this reduces the available space somewhat. For example, if you have a NAS box with four (3) 4TB drives in it, instead of having 12TB of space, you only have about 8TB of space available. While RAID 5 offers protection from a single drive failure, do not confuse RAID 5 with a backup. It does not protect you against data loss from accidentally deleting files or files that have been corrupted or saved over. So you still need to backup your NAS box to another drive or to the cloud if your NAS box is used for anything other than a local backup of data stored elsewhere. This can be more difficult than backing up an EHD, because of the large amount of data involved. NAS boxes with only two drives are typically setup as mirrored drives (this is known as RAID 1). In this setup, you have two identical drives, where one drive is an exact copy of the other drive, so when one drive fails, you can keep working with the other drive. You can then replace the failed drive and the mirror drive will rebuild. This is a less expensive and less complex setup than RAID 5, but you lose half the disk space. For example, if you have a NAS box with two (2) 4TB drives in it, you only have 4TB of storage space (not 8TB). Compare this to the RAID 5 example setup, with three (3) 4TB drives providing 8TB of available storage. By adding only one extra drive, you get twice as much space as two mirrored 4TB drives. NAS devices are a lot more expensive than EHDs. Not the same as a true backup. If something is deleted or corrupted from one drive, it will also be deleted or corrupted on the other drive(s). If you are a photographer who uses Adobe Lightroom, your photos can be stored on a NAS box, but your catalog cannot be. This is an intentional limitation to prevent corruption from sharing a Lightroom catalog over a network. If you (or someone you know) is comfortable with the technical aspects of working with a NAS box, we personally use, and recommend, the Synology Disk Station. We have four 4TB drives in ours in a RAID 5 setup, providing 12TB of storage. [2019 Update] One More Option! 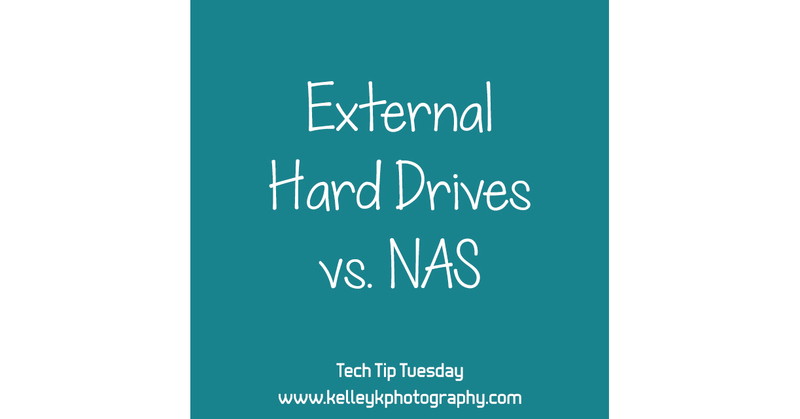 Since I originally wrote this blog post, I learned more about a third option that’s sort of in-between an EHD and NAS, and it’s referred to as Direct Access Storage (DAS). The most common brand for these devices is Drobo. These devices contain multiple drives in an array that work together as one drive, like a NAS, but they connect directly to your computer, like an EHD. While these devices are a more expensive solution than a standard EHD, they offer more space and built-in redundancy. Drobo actually makes both DAS and NAS devices, and they are designed to be even more user-friendly for the consumer market. They have become very popular with photographers in recent years. While you’ll get more hard drive space than an EHD, the main downside of using a Drobo over an EHD is the price. You’ll end up paying about $1,000 for a Drobo, plus four 4TB hard drives (which will provide around 12TB of total storage space with redundancy). I hope you enjoyed this Tech Tip Tuesday! Comment below to let me know what you think, or if you have any questions about this or other topics you’d like me to cover in the future. Or contact me about my consulting services if you need more one-on-one advice.